The building housing the R.V. 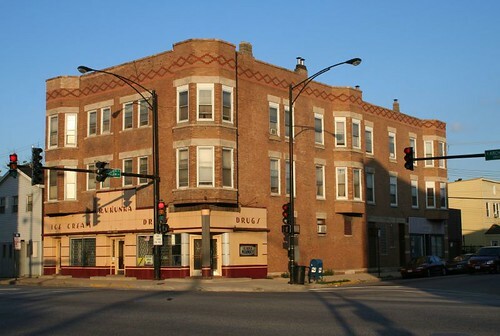 Kunka Pharmacy is part of a long line of commercial structures on the south side of Archer Avenue. It is located at a 6-way intersection with Loomis and Fuller Streets. This typical late 19th Century building got a snazzy update some time around the 1930s. Glazed panels, modern fonts, a two-tone color scheme, and an emphasis on horizontal lines combine to form a Streamlined slipcover storefront. Though easy to overlook, the entryway to the store is the focal point of the remodeling. Two vertical plastic “pilasters” appear to light up from within, marking the main door. The doors themselves feature stylish door pulls. Even the concrete step was given a reddish tint to harmonize with the facade. Whatever was once on the north side of this street was mostly blasted into oblivion by the coming of I-55. Today, many of these buildings face a Chinese Wall of concrete retaining walls and fenced-off areas beneath looming overpasses. 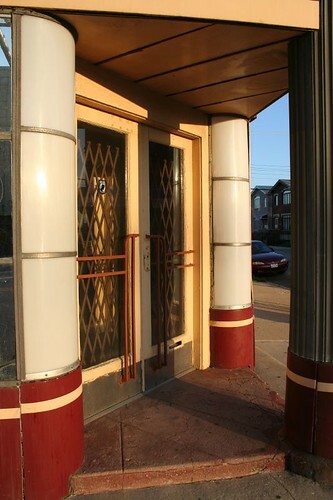 This entry was posted in Art Deco, Mid-Century Retail and Storefronts, Porcelain Enamel storefronts. Bookmark the permalink. That’s a great discovery still trapped in time! I like it! I remember going to Kunkas. My gramma and godparents lived on Elias Court. My dentist was in the back of the drugstore. His name was Kowalski. His original place of business was torn down for I-55. I have vague memories of a soda fountain in the store. I can remember the smell of the store, but how to describe a smell? Robert Kunka was my grandfather. In the '30-50's two rooms on the first floor were devoted to the soda fountain. The store had a wonderful smell – a combination of Horlick's malt, chocolate syrup, strawberries, bananas and pineapples from the soda fountain; cashews and other nuts in the heated revolving display near the front, and cigar and pipe tobacco in the humidor. The original first floor is actually below grade as the building was built before the streets were raised. Thank you for your history of the structure. I just drove past it and knew it was a treasure, so I goggled it. As a lifelong Chicagoan, I’m very interested in these older buildings. 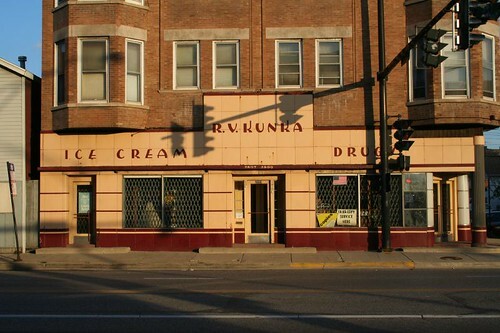 As a kid going to Kunka’s for a malted or sundae was always a treat. The soda fountain was the classic 1950’s teen hangout. I grew up in the neighborhood and my grandmother owned a popular candy store a few blocks from Kunka’s. I remember all the stores and shops.along Archer back in the day. It was a different and more innocent time.